It seems with each passing day there is more and more evidence to back up the belief that diet and lifestyle choices can battle the effects of aging and promote health. The thought of merely “dying from old age” is becoming increasingly harder to believe; ultimately, it seems like people get diseases later in life based on the decisions they made when they were younger. Now this isn’t true all the time, but it is a lot of the time. And new developments are continuing to show that even cognitive disorders, like dementia and Alzheimer’s disease, which were long accepted as a natural part of aging, can be prevented or kept at bay through some simple lifestyle choices—including eating the catch of the day. 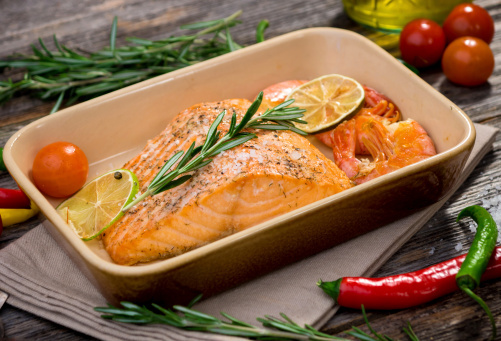 Researchers at the University of Pittsburgh’s School of Medicine recently discovered that eating baked or broiled fish on a weekly basis can boost brain health. They found people who reported eating fish prepared by either baking or broiling had more grey matter volume in their brains (associated with memory and cognition) than those who ate it less or not at all. They arrived at their conclusions by asking 260 people about their dietary intake, how much fish they ate, and how it was prepared. These participants then underwent high-resolution MRI brain scans. This adds to findings already suggesting lifestyle choices have an impact on your risk of Alzheimer’s or dementia and the maintenance of your brain function. There is evidence showing that increasing physical activity, having a healthy weight, eating a balanced diet, limiting alcohol consumption, and quitting (or, better yet, refraining from starting) smoking can reduce your risk for these conditions and promote brain health. What was interesting is that doctors noted that the prevalence of omega 3 fatty acids in the fish didn’t seem to have an impact on brain health. Omega 3 fatty acids have a number of recognized health benefits, including improved cognition and brain function. Some fish are higher in omega 3 than others, but the variety really didn’t seem to matter; it was all about the preparation. If the fish was fried or deep-fried, for example, there were no benefits to brain health. Omega 3 fatty acids are destroyed in the high heat required to fry fish, stripping it of this important nutrient. So it appears as though any amount of omega 3 offers health benefits, even if it’s in smaller servings. Omega 3 fatty acids are typically found in oilier fish selections. Alzheimer’s disease and dementia are already a big problem, and it’s only expected to get bigger. Current estimates are that in about 25 years, roughly 80 million people will be suffering from some sort of dementia. Therefore, a preventative lifestyle becomes a major factor in preventing this explosion and relieving the healthcare system and the families of those potentially 80 million patients suffering from cognitive decline of the burden of care. Your future is really in your hands. You can choose to ignore your health with the decisions you make or you can embrace a preventative lifestyle that has the potential to keep you healthier well into your later years. In life, there are no guarantees; a healthy, preventative lifestyle doesn’t always ensure you won’t get sick, but following a lifestyle that disregards healthy choices will almost surely come with consequences. University of Pittsburgh Schools of the Health Sciences, “Eating Baked, Broiled Fish Weekly Boosts Brain Health, study says,” ScienceDaily web site, August 4, 2014; http://www.sciencedaily.com/releases/2014/08/140804123358.htm.